During the night we passed the reefs of the dangerous narrows between the islands of Jebel Zuquar and Hanish. Our Arabian pilot demonstrated cat-like eyesight as he could locate even the most distant reef in this dark night without moonshine. In the morning, the sea is quieter. On the right is the African mainland, on the left is the Arabian coastline on which appear the high jagged mountains of Yemen whose steep cliffs reveal a different type of landscape than the granite mountains on the Northern coast of the Red Sea. A view through the telescope also shows some spare vegetation on the front of Yemen’s mountains. At the shore glister huts and tents, probably occupied by Arab nomads. After the church service we pass through the straits of Bab-el-Mandeb, the „gate of grief“, a name verified by the silent witnesses of so many wrecks. A giant turtle of nearly 2 m length surfaced a few paces away from the fore, observed us with its large yellow head for a number of seconds and vanished again in the sea. Now the African coast disappears more and more while Arabia’s 844 m high rocky Jebel Kharas comes into view. A large smack of jellyfish is approaching. They glitter and glow in the most beautiful rose red and dark violet colors which makes us stop the machines to pick up some of these sea flowers. At 8 o’clock in the evening the lighthouse of Steamer Point was blinking and soon we were anchoring in the outer harbour of Aden. A small English patrol boat, the cannon boat „Redbreast“ and three large steamships were moored in the harbor, where just a powerful English transport ship was hoisting its anchor. This colossus let loose its steam whistle and departed quickly towards the East, probably in the direction towards India. Just after we had dropped the anchor, the consular representative came on board, followed by a couple of merchants who eagerly offered their services in numerous languages. 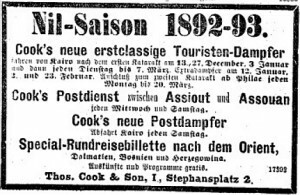 ANNO – on 26.12.1892 in Austria’s newspapers. Due to Christmas Day, few newspapers are published on 26 December. Time for the Wiener Sonn- und Montagszeitung to shine: In Dublin on 25 December, a dynamite bomb killed a British detective, wrecking the detective office. In Paris, the Panama scandal is hotly debated. Dieser Beitrag wurde am 26. December 2017 von wordpressadmin in diary veröffentlicht. Schlagworte: Aden, December, on ship, Red Sea. The South wind became stiffer and stiffer. The huge sea waves made it questionable whether church services could be held. Only our brave chaplain did not let himself be intimidated and read mass on the altar which was surmounted by the standard, despite the fact that all lights went out and the candelabra tumbled down. In the afternoon the islands of Jebel Teir und Zebayir came into view, naked empty islands without any vegetation. Again some flying fishes crossed our path like silver stars. Of birds, I observed besides the common seagulls multiple flocks of swifts. The sea grew more and more violent; wave upon wave crashed onto the bridge on which we, completely drenched, stayed during nearly the whole evening and admired the impressive play of waves. 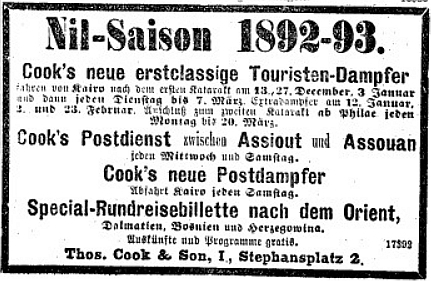 ANNO – on 25.12.1892 in Austria’s newspapers. On 22 pages, the Wiener Zeitung lists the army promotions separated by rank and branch of service. The Wiener Salonblatt notes that the Emperor is spending Christmas with his son-in-law, Prince Leopold of Bavaria, in Munich while the Empress departed from Palermo, Italy, to her villa Achilleïon on Corfu. It also informs its readers about the progress of Franz Ferdinand’s journey as well as fellow passenger Archduke Leopold Ferdinand (who will be recalled shortly after Franz Ferdinand’s plea to the Emperor to do so). The Salonblatt states that they arrived in Port Said on 20 December and departed the following day to Colombo (Ceylon) . It pledges to provide a weekly update about the journey. Dieser Beitrag wurde am 25. December 2017 von wordpressadmin in diary veröffentlicht. Schlagworte: December, on ship, Red Sea.